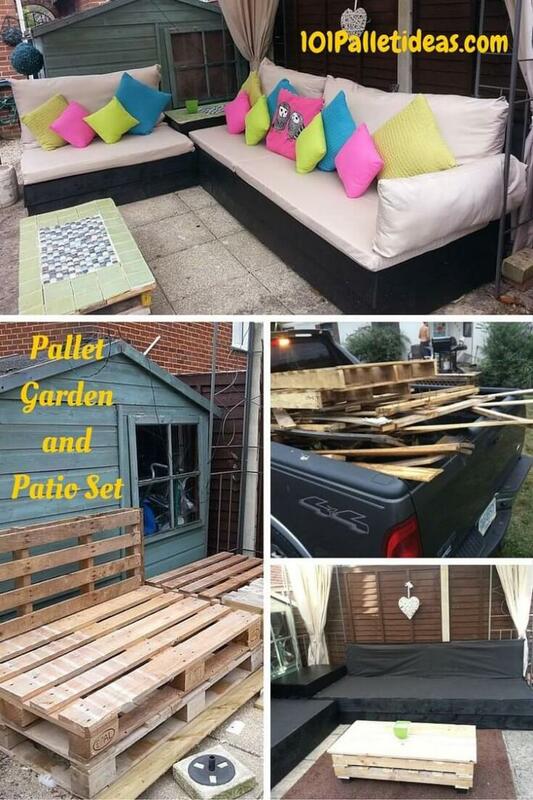 In today’s post, you will came to know that how your can create a little heaven with pallets at you patio or in your garden space! The plan is as always simple, thrifty and less time taking! We are again with a marvelous pallet recovery that is sure to drop your jaws with amazement! 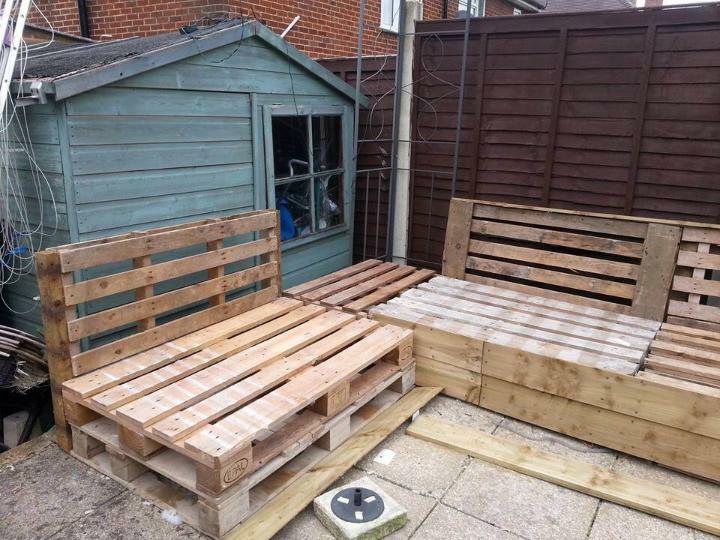 Something highly precious has been created with pallets here that can give very new and remarkable style statements to your outdoor without spending a bit extra of your money! 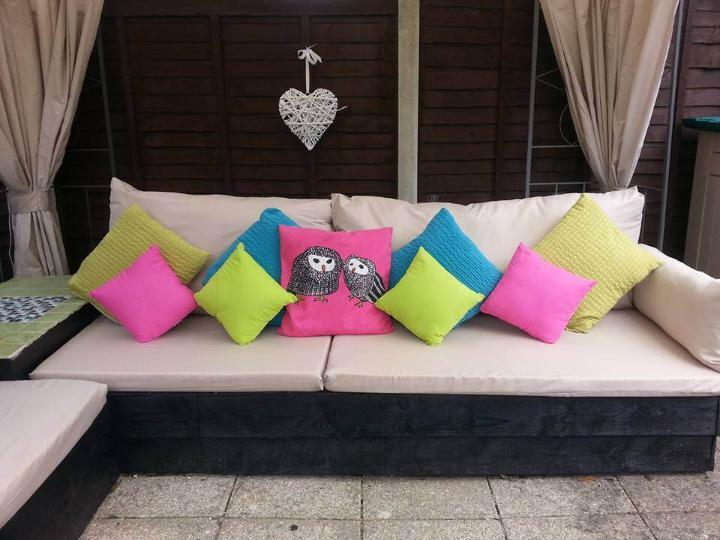 We are just talking about this fanciful DIY pallet patio sofa, a whole sitting plan to entertain your guests, visitors and relatives in open sensational environment! 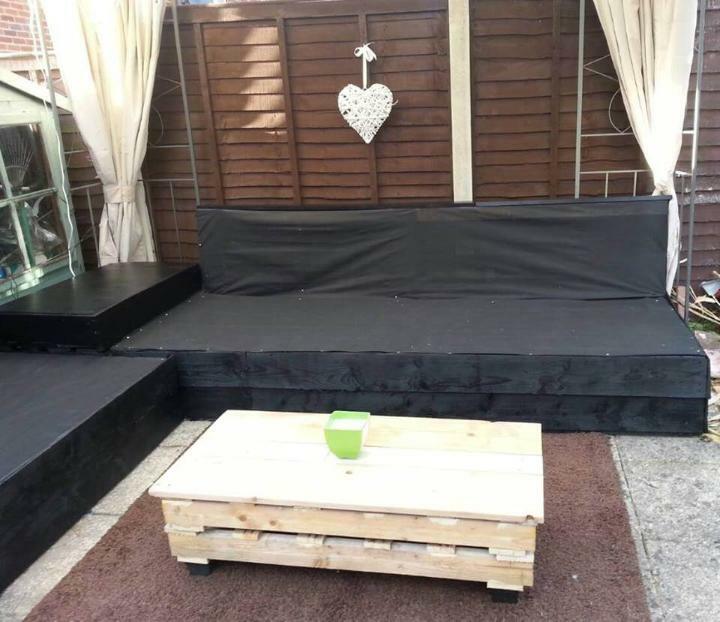 Using the uncut and undivided lengths pallets boards this creative achievement has been made that establishes sophistication to whole of the patio! 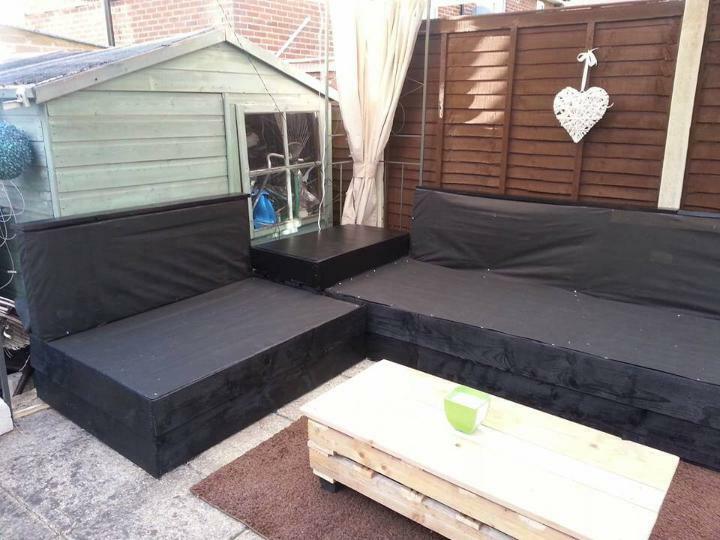 To go for its construction at home or to follow this tutorial or guide you will need some pallets, screws, water proof black fabric, black paint and cushions! This pallet sectional sofa design is highly budget-friendly but can beat those expensive market-bought designs in both stability and sturdiness! 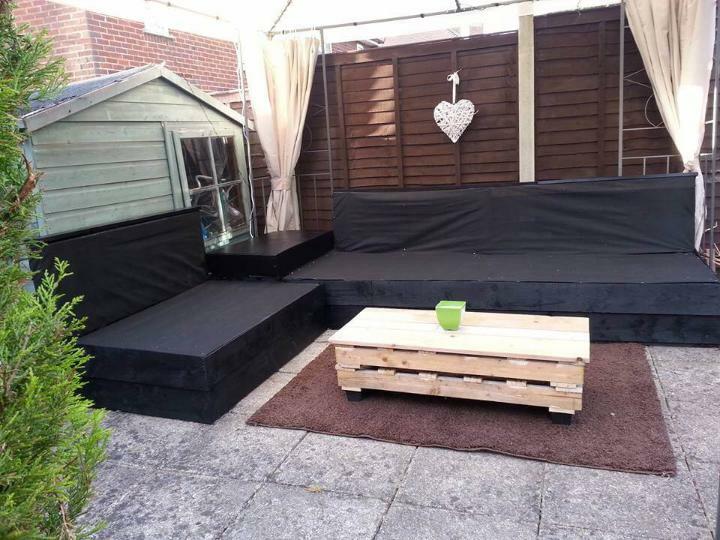 Choose the heat treated pallet boards for Eco-friendly installation of your sofa set! 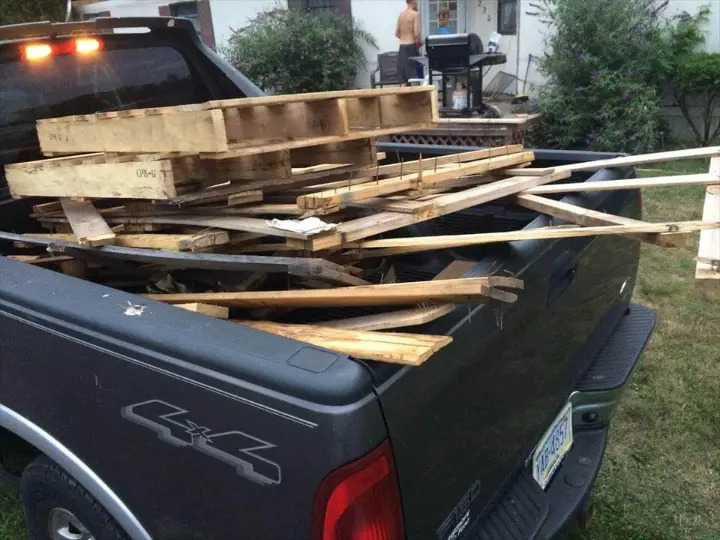 Try to use the less-used and good looking pallets so lesson your work of sanding and cleaning the pallets! 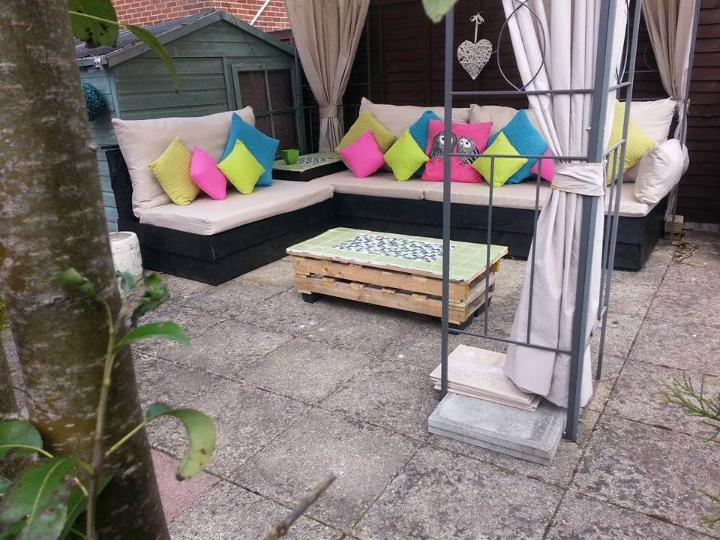 Now plan the dimensions of your sofa to fit well to the targeted patio space and start stacking of pallets to get amazing berth section and backrest positions with desired height levels! Use more wood and screws to hold the boards together and in place! Also install a side table and a side seat in the same way to give it an L-shape for perfect corner and sectional fit! Trim down the sizes of whole pallet boards while installing the tables for this whole sofa set! Use extra wood at the top of the backrest position and at the front of berth sections, this will also hide the opening and pockets of pallets boards! Cover the entire sofa design with water proof fabric and add nails to get the fabric well settled down on the sofa frame! Remove the creases and stretch the edges then add nails to give a super smooth and plane look! 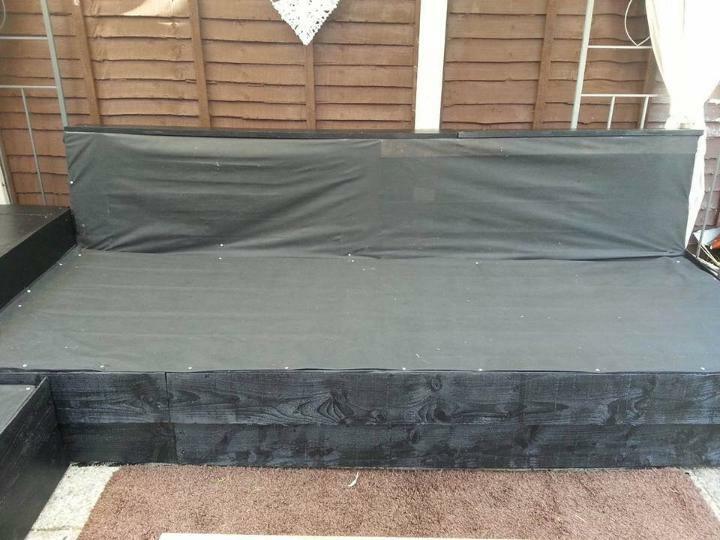 One can also use the staple gun to cast the fabric nicely along the edges and sides of the sofa! 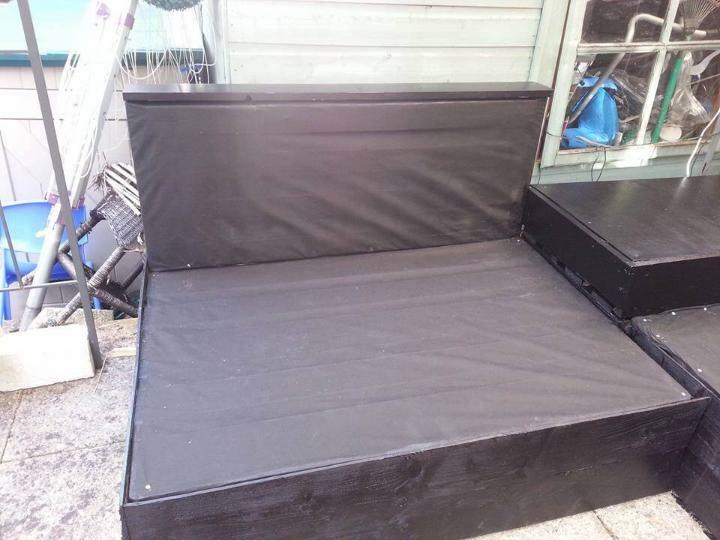 Also cover the side seat and side table to get all in dominant black shade! Black really blends perfectly in to each color and style of decors and would also be friendly to your outdoor! You can also use more thin wooden sheets or lengths to hold the fabric firmly in place! 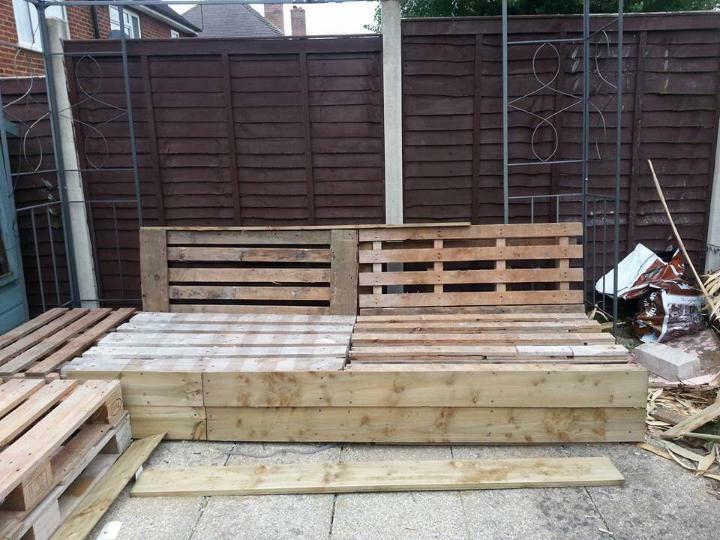 Now load two more cut down or trimmed pallet sizes to build a coffee table to put in front of sofa, It will really be a conversation piece and also a conversation starter if you put some decors over it! You can easily serve the refreshments using this table to entire group of your seated guests and it will be in everybody’s arm reach! Now let the paint dry for some time and review it again to analyze the mistakes and imperfections, if you find any, just remove it using your own genius mind and creativity! Now you are just a one step away from getting a lavishly chic sofa design! For perfect sitting organization, take care of some little but useful things like to add a flower vace, a candle votive and also to place a carpet piece or rug beneath the coffee table! Table can also be painted to match it to surrounding decors! Finish your couch with a heavy duty foam mattress and also make a bunch of cushions using old clothes and printed fabric pieces! Make the borders extra soft and comfortable to maximize the sitting comfort level! 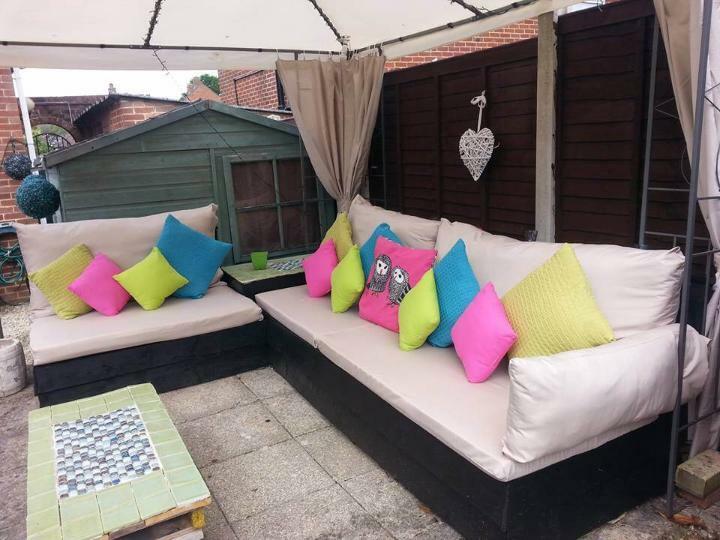 Try to match the cushion with the curtains of your gazebo also build the backrest cushions in the same color for more eye-catching effects! Both coffee table and side table have also been modernized using grouted ceramic tiles with mosaic pattern inlay! Grouted tiles really add warmth and coziness to whole of the sitting plan and double up the fun level!